Ribbon cables and headers, COAX, USB, HDMY, power. Cables and connectors of all sorts. 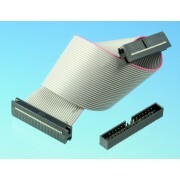 GPIO Ribbon Cable for Mini2440. Length 8.25 inches (21cm). With 34 pin 2mm headers - Sullins C..